Oberheim DSX Digital Polyphonic Sequencer and DMX Programmable Digital Drum Machine advertisement from page 46 and 47 of Keyboard Magazine November 1981. This two-pager ad started running in mid-1981, and as I mentioned in my previous blog post, contains one of the earlier mentions of the tech behind what would eventually be marketed as 'The System'. But at this time, Oberheim was obviously excited to sell these two as a pair, keeping the OB-Xa strictly in the background. 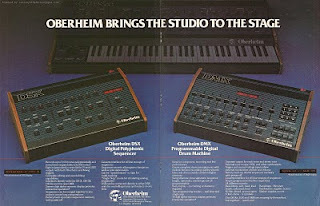 Although Oberheim didn't let their excitement get in the way of their ingenuity - they built this advertisement in such a way that it could easily be split in half, effectively creating two individual advertisements, if space or ad budget became limited. "Oberheim Sequencer and Drum Machine. The DSX is a polyphonic digital sequencer with a 3,000-note memory that can be expanded to 6,000 notes. Its features include editing, overdubbing, 16-voice capability, and the ability to merge sequencers in any order. Direct interface is possible with the Oberheim OB-X,OB-SX, and OB-Xa synthesizers and the DMX drum machine. The unit also has eight independently controlled voltage outputs and eight gate outputs, each with user-selectable positive- or negative-going outputs. Real-time programming, a single-step mode, and synchronization to tape for multi-tracking are additional capabilities. the DMX drum machine uses real drum sounds that are stored in digital memory. You can program song structure, time signature, sequence length, dynamics, and tempo in either real-time or single-step mode. The unit has 24 voices, including soft, medium, and loud bass drum; soft medium, and loud snare; open, closed, and accent hi-hat; six different tom-tom sounds; three cymbals; handclaps; rim shot; regular and accent tambourine; and shaker. The DMX also has separate outputs for each voice in addition to stereo outputs. It has inputs to allow external modulation of pitch and volume, and comes with 50 pre-programmed rhythm sequences. An external sync function makes it possible to sync the unit with tape, the DSX, and Oberheim synthesizers. Both the DSX and the DMX feature 16-digit alphanumeric displays, battery back-up for memory retention when power is off, and built-in cassette interface for off-line storage of sequences. Proces are: DSX: $1,700.00; DMX, $3,000. Oberheim Electronics, 2250 S. Barrington, Los Angeles, CA 90064"
The Spec Sheet write-up is interesting from a historical perspective for a couple of reasons. The first is because it does mention that fact that you can directly interface the DSX with other Oberheim gear ('The System'!). But, almost as interesting is that the Spec Sheet mentions the 16-digit alphanumeric displays of both units. The 16-digit displays are also mentioned in this advertisement! 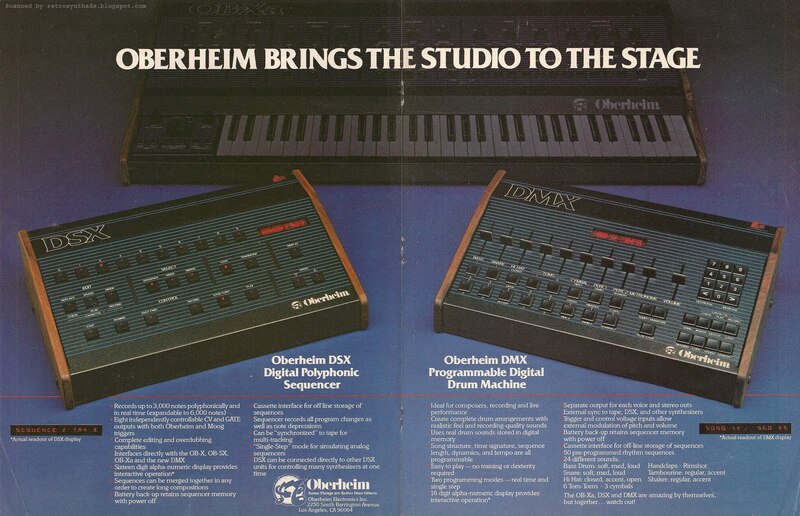 And they are important enough that Oberheim devotes the resources and space required to provide a photo of both the DSX and DMX displays, with copy promoting the fact that each photo is of the "actual readout". Funny thing to promote, I thought. And then I started thinking about it. Until now, I've never really thought too much about the evolution of displays on gear. Like most people probably, I've kinda taken them for granted. There there when you needed them. Then, as the word "digital" and "memory" started creeping into gear design, small displays started to appear to help users with things like the storage and retrieval of sound patches. As the software side of things progressed further, there was theoretically a decreased need for as many physical buttons, knobs and dials. You could assign one knob to control a lot of different functions - all programmed through the OS with the current function of the knob showing in the digital display. And so the need for good user-interface design started to affect both hardware and software side. I started flipping through a few issues around the time this advertisement appeared, and sure enough, when I looked at other manufacturer's gear, it turns out a 16-digit display is a PRETTY SWEET DEAL. The Roland Jupiter 8: 4-digit display. Linn LM-1: two 2-digit displays. The Octave-plateau Voyager One probably came closest with their three 2-digit displays and five 1-digit displays. But they were still really limited to the amount of information it could offer. No real words could be displayed very well. Now, I know what you are thinking - 'cause I was thinking it too. The DMX and DSX were NOT simple synthesizers. They were machines that had a lot more programming ability, so obviously Oberheim *had* to provide a larger display. Well, the Synclavier II, another advertised piece of kit around this time period, slammed a whole computer into it's guts and included a 16 track digital sequencer - and it looks like it only had a 4-digit display (never seen one in RL though). Oberheim's display was really the next best thing to a full-on computer screen at the time. In a way, Oberheim's 16-digit display was really the C-3PO of the DSX. I'm Luke Skywalker, and the OS of the DSX is R2D2. And that16-digit display is doing a dang fine job of translating all those 1's and 0's of the DSX OS into something a human can understand. Did I really just compare Oberheim's OS to Star Wars?!?! You know anything about the prototype DMX in the advertisement with the 2 buttons per voice instead of 3 and the centered display? Paul White from ElectronGate has been looking for info on it and I've ended up curious too.